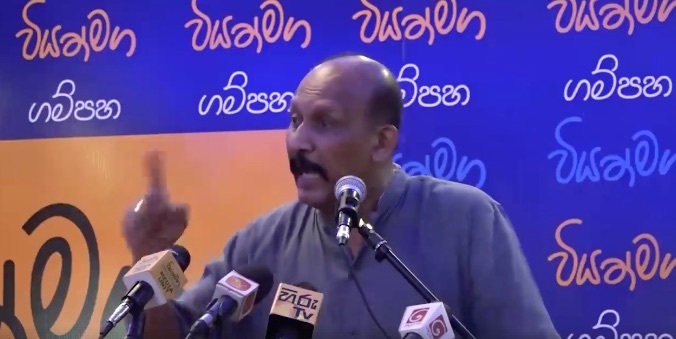 Retired Major General Kamal Gunaratne insisted that the “traitors” who attempt to divide the country introducing a new constitution must be killed. Reminding the 1986-1989 JVP insurrection he said those traitors must not be given a decent funeral. The former Commander Security Forces Headquarters – Wanni made the above remarks on Saturday in a meeting organised by Viyathmaga. Former Secretary to the Ministry of Defence Gotabaya Rajapaksa chaired the meeting, which was also addressed by General Secretary of the Patriotic National Movement Dr. Wasantha Bandara, Design Director of Kandygs Anuradha Yahampath and Dr. Nalaka Godahewa. Gunaratne said that the government was trying to bring in the new Constitution on the requirement of the Western forces and Tamil Diaspora to please Tamil separatists. He also criticised the government’s reconciliation process. If this is the mentality of an ex-army general who commanded the 58th Division during the closing stages of the civil war, what he would done during the war? Is he the army commander who is responsible for killing the white flag LTTE surrendees led by P. Nadesan LTTE police chief on May 18th, 2009? About 300 surrendees including LTTE P. Nadesan, Ramesh, Pulithevan, Mrs. Nadesan and others died in a hail of bullets! Pictures appeared where Ramesh was seen tormented by soldiers in uniform and later his body along with Nadesan, Puliththevan seen lying in the ground riddled with bullet wounds. And who killed about 100 second rank LTTE leaders who surrendered at Vadduvaakal on the evening of May 18, 2009? Those who killed include Balakumar and his son whose pictures appeared sitting on a bench inside an army camp? Others include Puthuvai Rathnathurai, Lawrance Thilakar, Elilan and many others. Rumour has it Lawrance Thilakar was placed inside a cement crusher and crushed to death? The President Sirisena and Prime Minister Ranil Wickremesinghe are exhibiting timidity in dealing with those who committed war crimes (except ex-LTTE cadres) and those who are issuing death threats publically and brazenly. The Joint Opposition and Eliya are upping their ante several notches up drowning the feeble defence of the government. Thangachchi, you say, “The President Sirisena and Prime Minister Ranil Wickremesinghe are exhibiting timidity ….” The problem is, like Prabha, they eat too much chicken curry and have become chicken like. The same thing happened to Prabha too though he was never a chicken despite eating much more chicken curry for much longer. Unlike the other two, he had to do it because of the Last dinner he had to have with the outgoing suicide cadres. But he too became complacent and too careful at the later stages of the war, though he, unlike RW and MS, was brave right to the end. The only comparison I can think of is Che’ Guevara who died fighting though he could have had the comforts of a Minister, had he not gone to Bolivia. God save Sri Lanka. If this the treatment the former General is suggesting for attempting to bring in New constitution one can imagine what would been the plight of those of who had taken up arms to establish a separate state. One shudders to think about it. If he had been born in Spain, by quake of fate, millions would be now on their way to meet their creator. Being taken to their graves carried six inches above ground and being carried by ropes tied around it. What a sick mind even to think about it leave alone making a speech at a meeting. Let us pray to God to save us from monsters of this calibre from taking over reign in this country. History has shown how Hitler and Mussolini made such blood curdling statements during their rise to powe. Hate is fire. Hate is sin. Hate is destruction. Hate is ruin. Any one wants to kill democracy is killing the nation and its people. If he is a member of the people he is committing suicide. Saro, “Hate is fire. Hate is sin. Hate is destruction. Hate is ruin.” a week ago I would have disagreed. But now I agree with you. A week ago I hated Prabha. Now I love him and I am trying to arrange a Pansakula on his death anniversary, for the many services rendered to Sri Lanka.